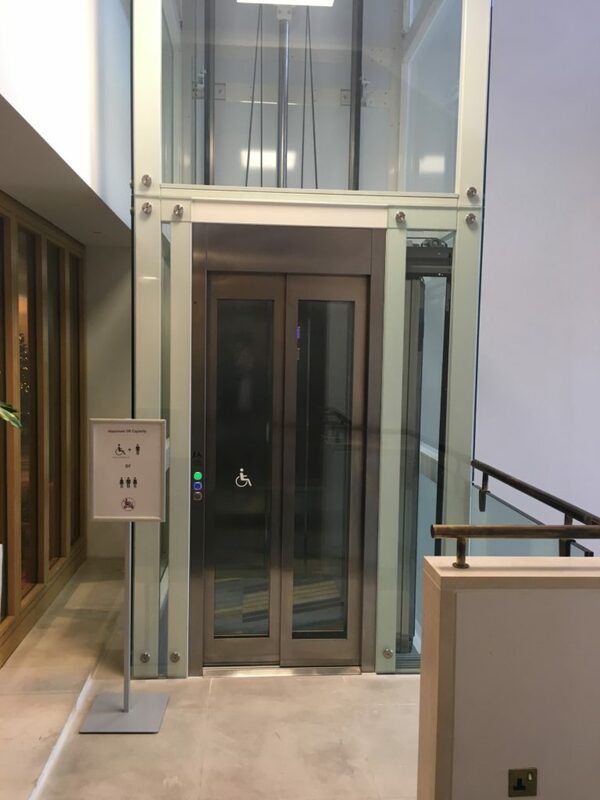 We were approached by the architect, De Matos Ryan, to measure for a disabled access lift in the British Library in Central London. The British Library is located next to St Pancras Station on Euston Road and contains copies of every book published in the UK as well as being the largest library in the world. The building it is situated in is less than 50 years old however it is a Grade I listed building which can make the construction of a lift very difficult. 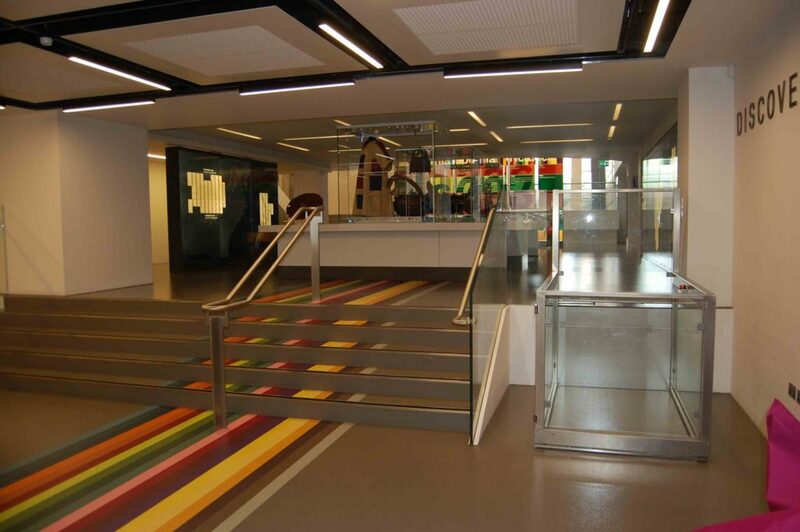 The client needed disabled access across 3 floors for library visitors as well as private functions that take place on the 2nd floor. The lift’s overall travel would be 5.8m. 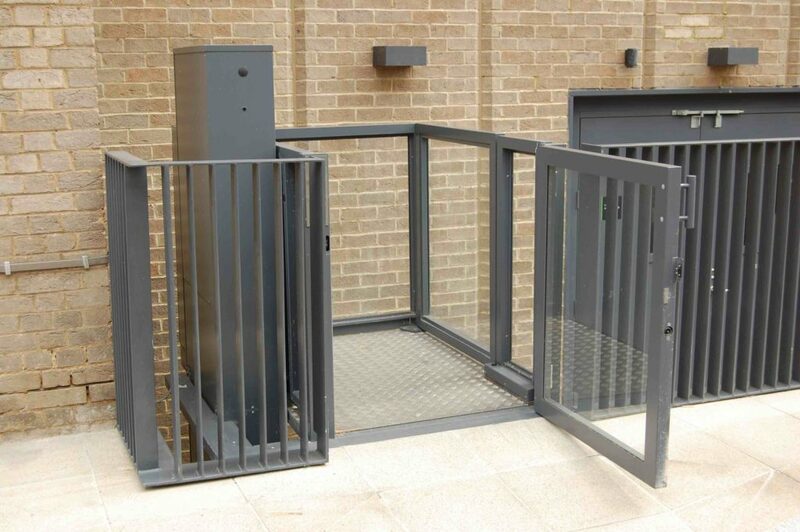 The disabled access lift needed to cover 3 floors and have adjacent doors on both 1st and 2nd floors as well as being perfectly aligned between the 2 steel beams supporting the roof. 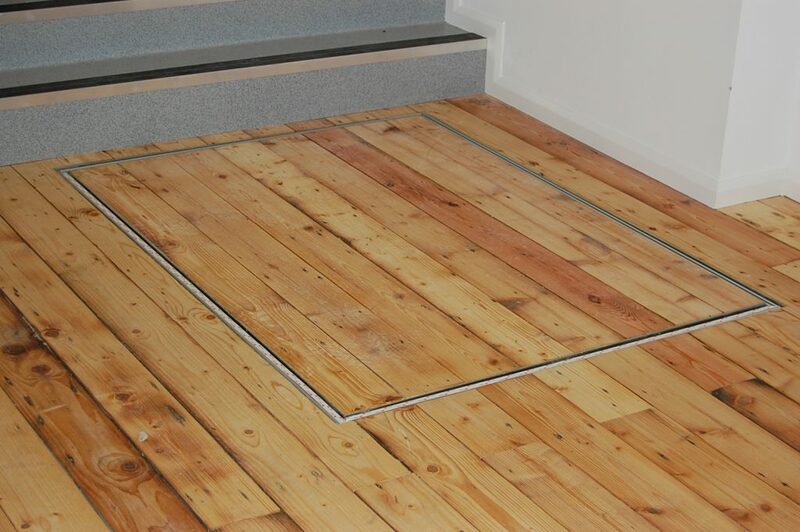 One of the initial challenges we faced was that for a lift of this size, a conventional lift would require a 1500mm pit below the lower floor level, however due to the small distance between the floor level and the ceiling of the floor below the maximum pit we were able to have was 130mm. In addition, a conventional lift would need 3500mm metres above the upper floor level however we had a maximum height of 2350mm as the ceiling could not be taking off or adjusted for the lift. The lift structure also needed to be able to support two landing balconies weighing 500kg each. 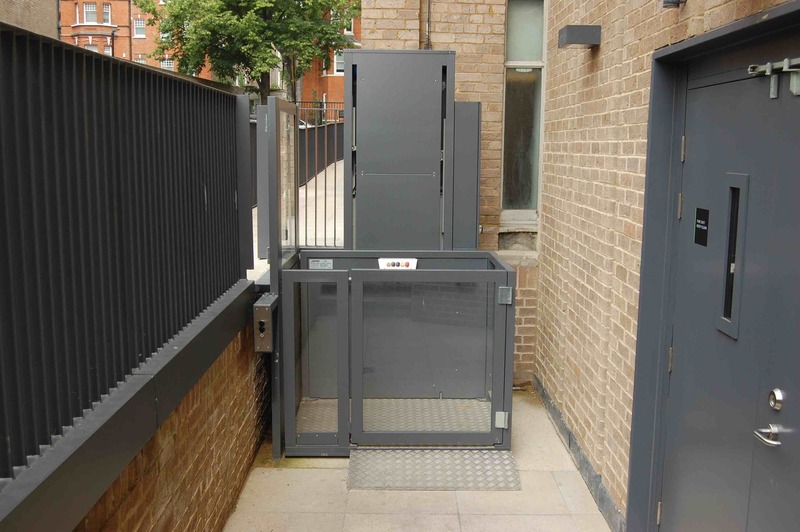 The disabled access lift that we installed was a Vertico inDOMO with platform dimensions of 1200mm x 1200mm. We had 2 sets of automatic power car doors adjacent to ground floor entry onto the balconies of 1st and 2nd floors. The architect wanted a white finished with pinned glass on the outside of the structure. This proved challenging as there were limited options to be able to position the glass panes as there were no points that could become a hoist. This resulted in the glass, weighing up to 120kg per piece, being carried up the staircase and then carefully placed and pinned in place. 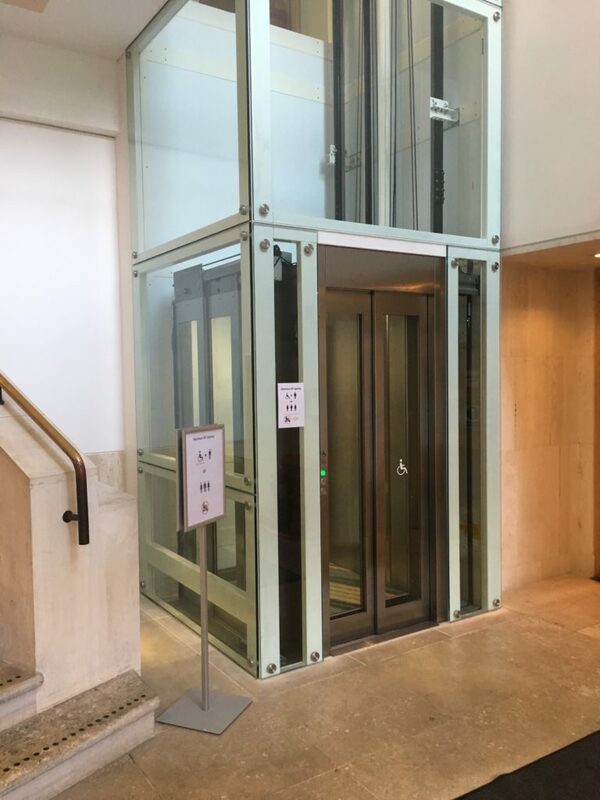 The lift now supplies disabled access for all library users and is an aesthetically pleasing addition to the Grade I listed building. 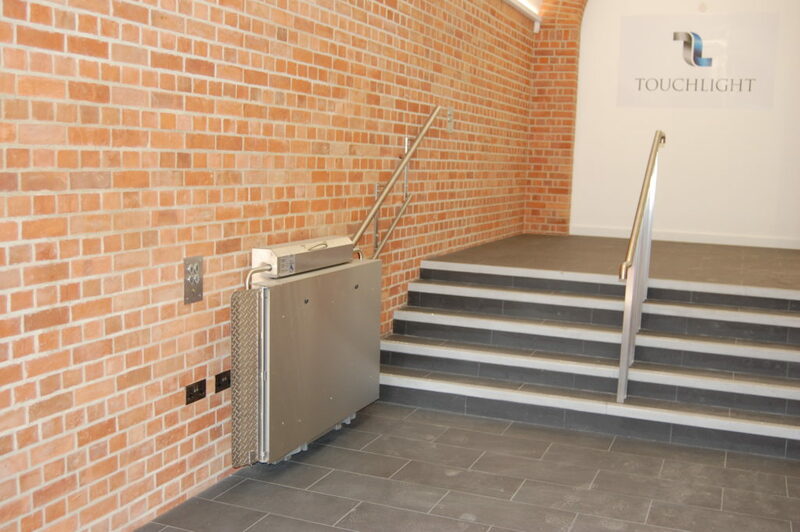 To see more examples of our disabled passenger lifts in commercial buildings and listed buildings, have a look at our National Theatre, York Theatre Royal, Wool House projects. 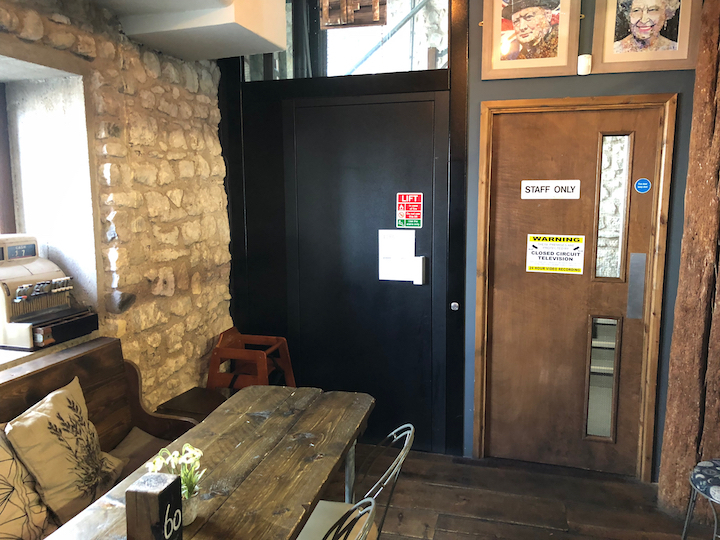 We were approached by the architect, De Matos Ryan, to design 2 lifts with very different applications during the refurbishment of York Theatre Royal. 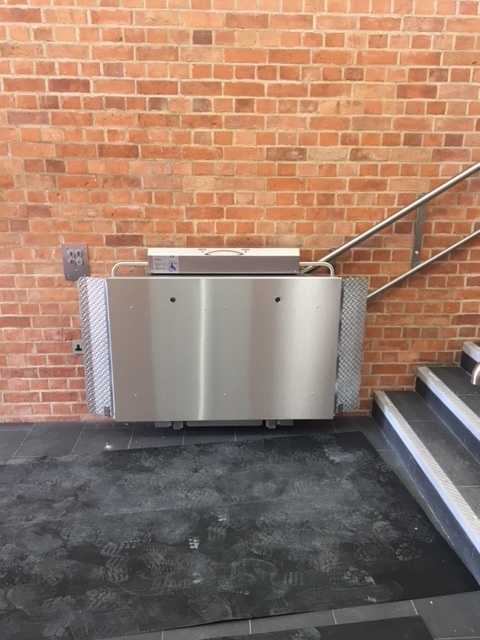 The first lift was to transport customers over 4 floors of the theatre whilst the second lift was to provide access to differing floor levels on the ground floor. The challenge of the larger of the two lifts was that it had to sit within a stone stairwell as to not to compromise the theatre's Grade II listing. This meant that we had limited space to work with as well as trying to match the aesthetics of the theatre. The lift had to travel over 4m with 4 sets of automatic doors on 3 different sides because the upper levels of the theatre had split floor levels. The lift allows all visitors to access every part of the theatre and see the many performances put on. 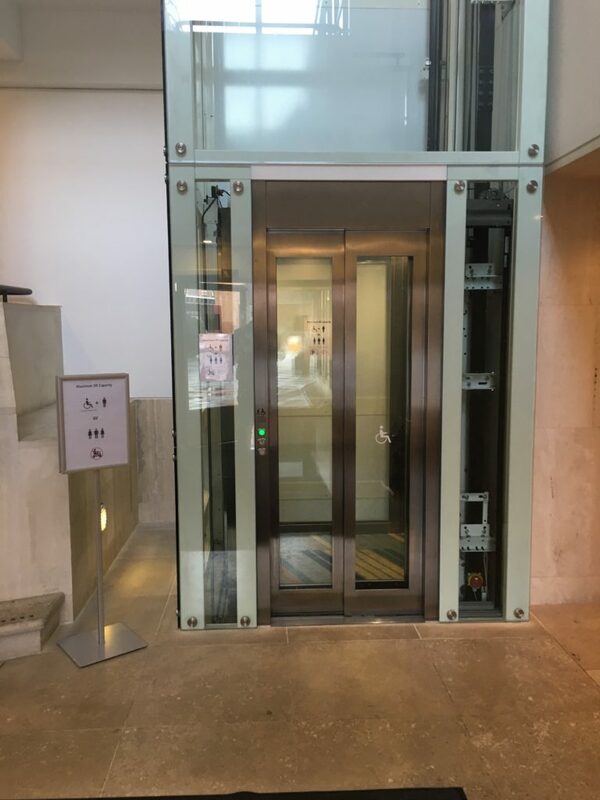 We fitted and installed an EP Elfo with platform dimensions of 1100mm x 1400mm in its own steel and glass structure with the lift car finished in framed glass on 3 sides with the remaining side mirrored. 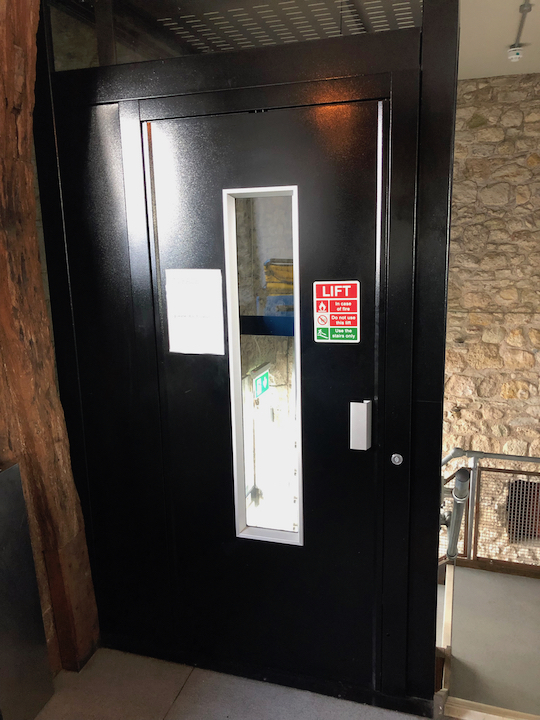 The theatre needed to provide access for all visitors to the restaurant as the ground floor had a split floor level - the difference was only 980mm so the theatre wouldn't need another passenger lift. We fitted an EasyLift by Liftup, a platform lift that is easy to operate and is really user friendly. The lift was finished in glass with a black steel structure so it would blend in with the style of the newly refurbished theatre. 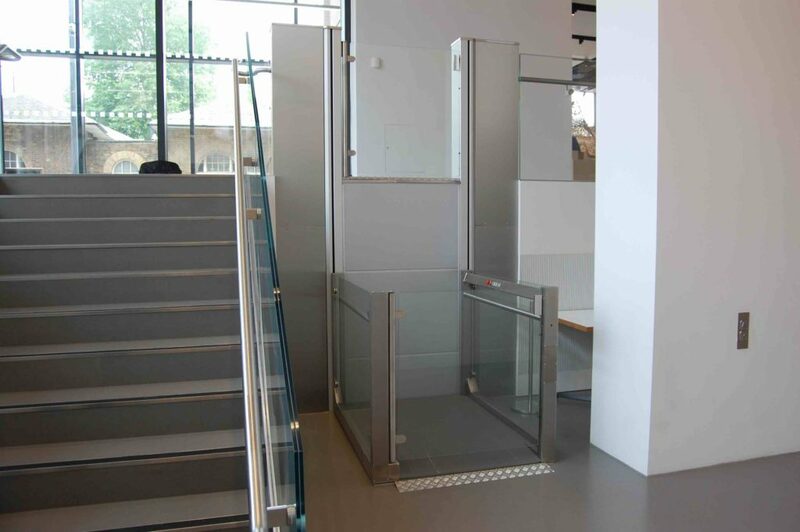 To see more examples of our platform lifts and disabled passenger lifts in commercial buildings and theatres, have a look at our National Theatre, British Library, National Army Museum, Venture House and Baltic Mill projects. We were approached by the National Theatre as they were undergoing a refurbishment to a large part of the theatre. 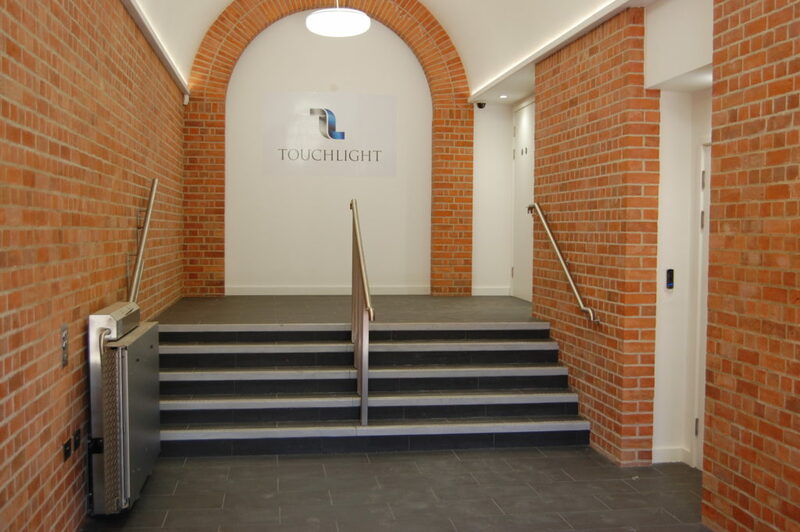 They needed to provide disabled access to throughout the building, unfortunately they couldn't make space for a conventional passenger lift due to the building's Grade II listing. The National Theatre is situated on the Southbank of the Thames and holds a host of productions from Shakespeare to more contemporary plays. Working with Lendlease, the construction management business, we designed and fitted an EP Elfo with automatic doors on adjacent sides. The lift travelled a distance of 12 metres across four floors, with entry points on two of the four sides of the lift shaft. 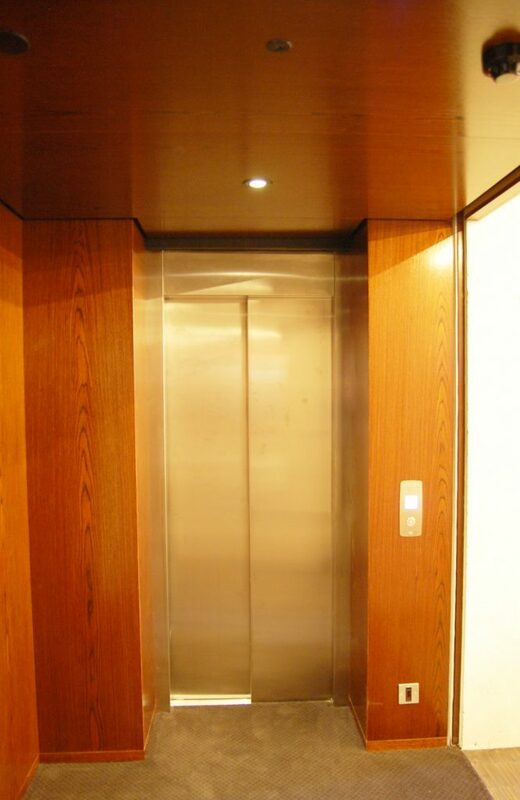 The client had strict criteria that the lift had to meet due to the building's Grade II listing. The ceiling of lift had to be anodised bronze to match the theatre's ceiling that had originally been installed in 1976. In order to match this requirement we used the same anodising company that had originally constructed the theatre's ceiling. We also replicated the handrail from the landings inside the lift car and used the same materials to create a handrail that is identical to those in the theatre. We completed the lift with the same flooring as the rest of the theatre, with the original carpet from 1971 being used in the lift car. 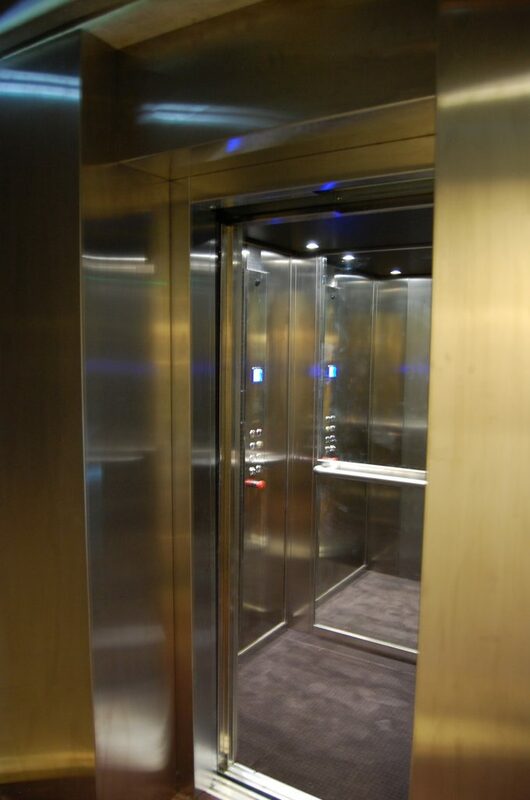 The rest of the lift was finished in stainless steel to contrast the wooden panelling and one of the interior sides was fitted with a complete floor to ceiling mirror. 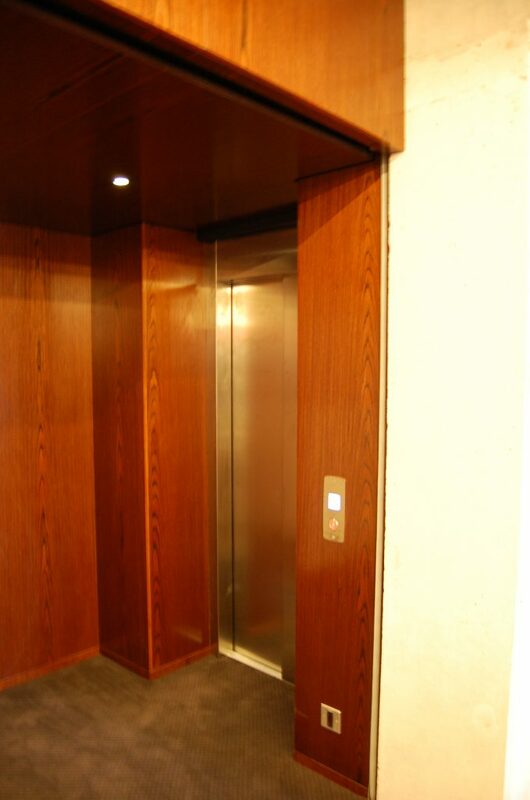 Even with the high specification of the lift, it was fitted within 4 weeks. 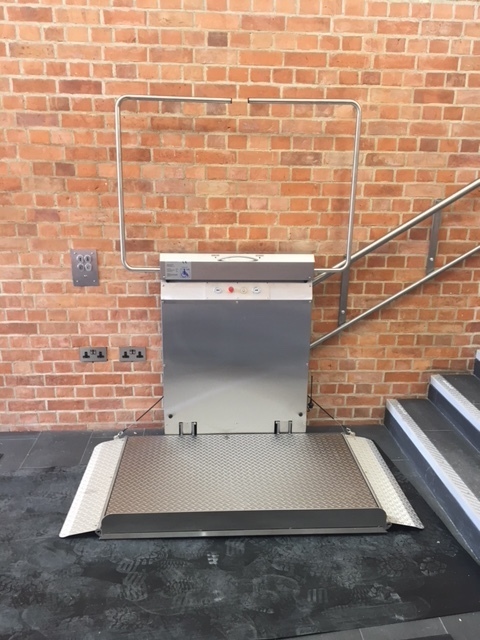 To see more examples of our disabled passenger lifts in commercial buildings and theatres, have a look at our York Theatre Royal and British Library projects. 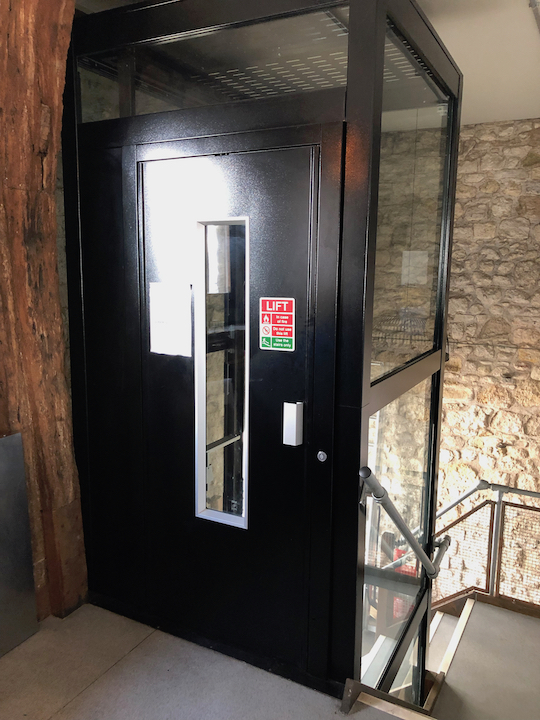 The owner of the Grade I listed Dancing Man Brewery & Pub came to us needing a pub lift that fitted the industrial aesthetics of the building and did not compromise the Grade I listing. 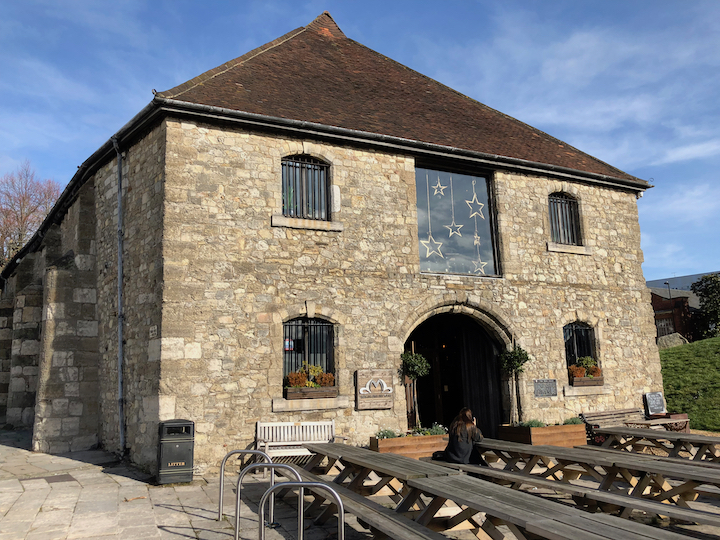 The Dancing Man Brewery & Pub is situated in the Wool House, Southampton. The Wool House is a 14th Century, Grade I listed building that has recently been converted into a microbrewery and pub. The owners wanted to make the 1st floor accessible to disabled customers so that they could experience the whole brewery. 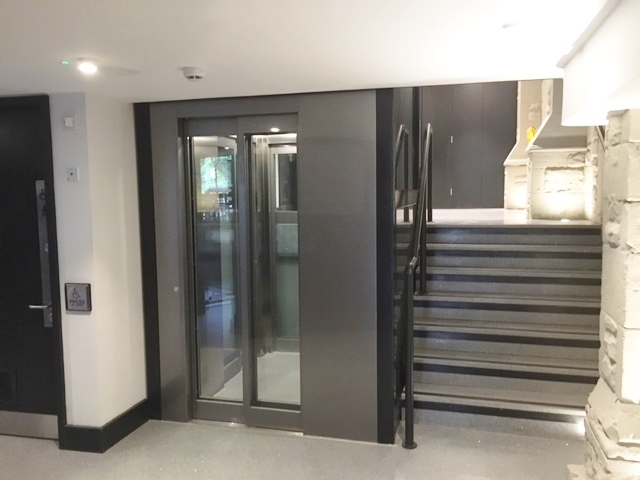 The main challenge that needed to be overcome was how to design a lift to fit into a 1450mm x 1450mm space that did not compromise the property's Grade I listing. 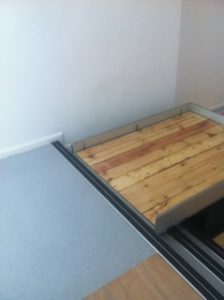 We came up with a small platform lift within its own lift shaft. 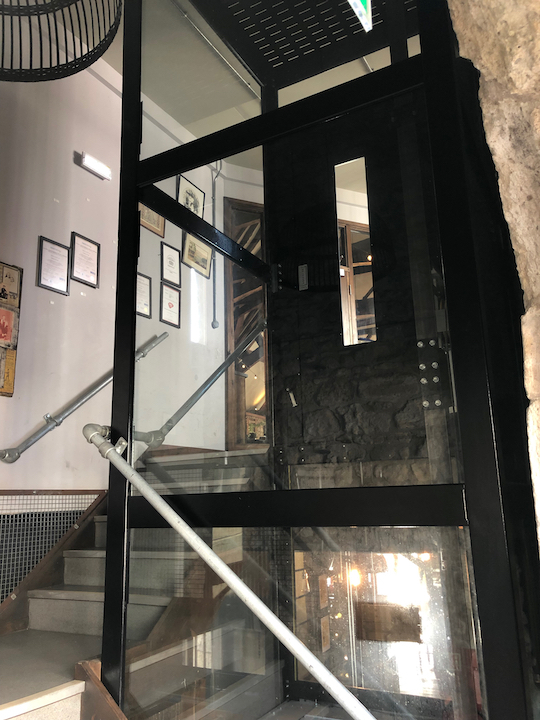 In order to meet the client's expectations of an industrial looking pub lift to reflect the building's historic past, we opted for a glass lift shaft with a black structure. This was so that the inner workings of the lift could be seen by the customers to give it a warehouse/industrial charm. The work was completed within 10 days and the lift was ready for the grand opening of the Dancing Man. 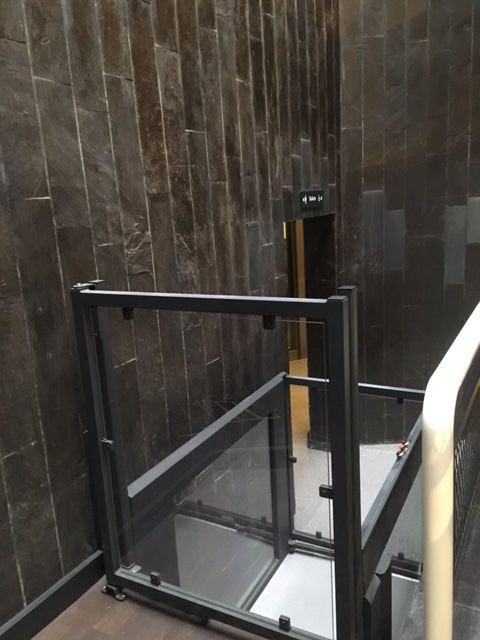 Our engineers even fitted the client's existing handrails to the lift structure as to maximise the space on the stairway leading to the 1st floor. 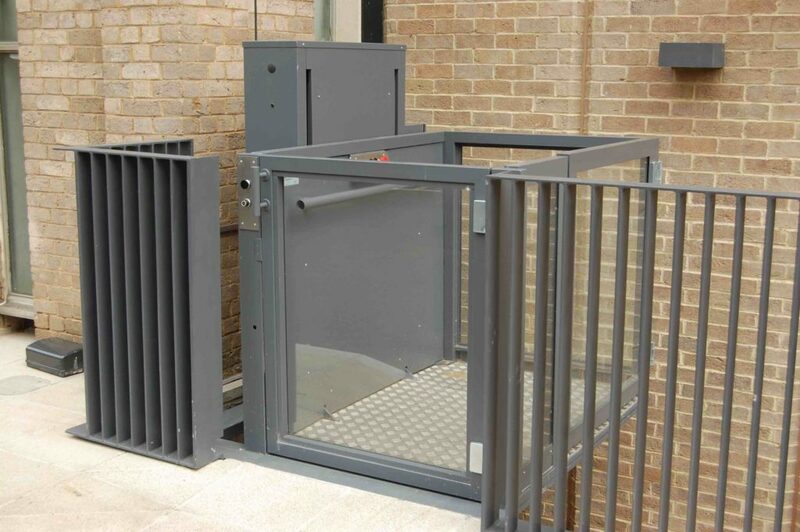 The client was really impressed with the finished article and said, "we were very pleased with how Access Lifts worked, the guys left the site neat and tidy ready for the grand opening." To see more of our projects in listed buildings click on the following links: York Theatre Royal, British Library, National Theatre and Inclined Platform Lift in Grade II Listed Waterworks. We were approached by the Baltic Centre for Contemporary Art in Gateshead to design an access solution that would provide both the necessary access for all visitors but also be in keeping with the BALTIC's contemporary design. 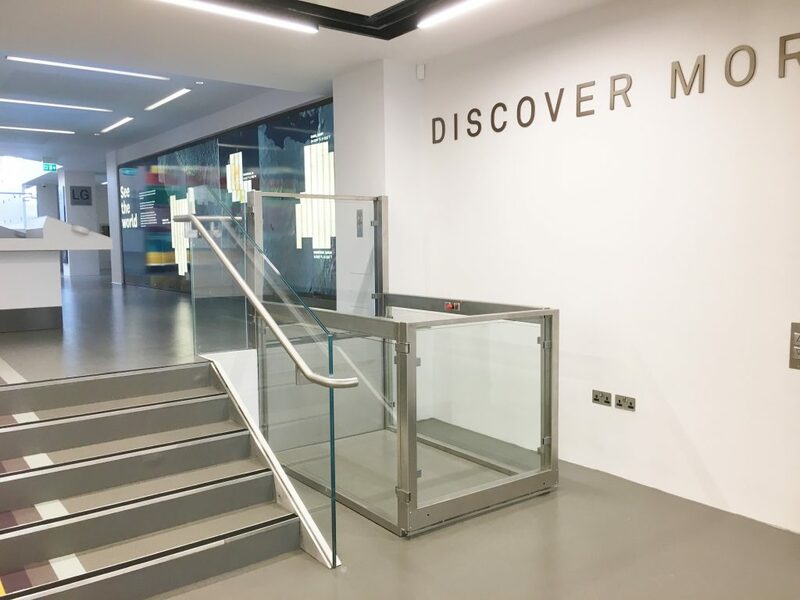 The client wanted to make the centre more accessible for disabled visitors and so decided to look for various lifting options. The Baltic Mill has an ever changing exhibition schedule and was the first venue outside of London and Liverpool to host the Turner Prize. 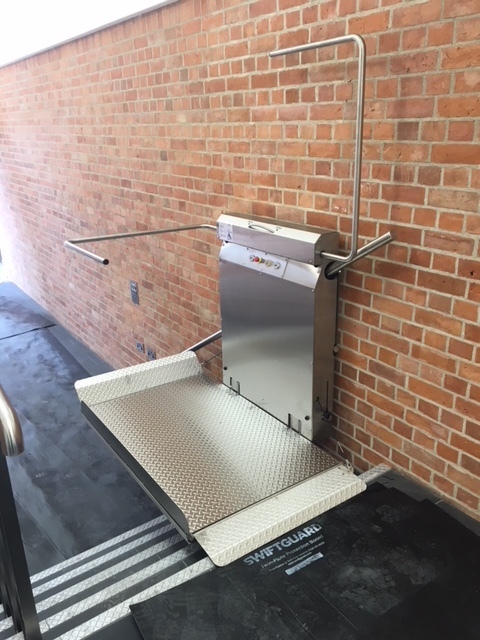 In order to create a simple solution that wouldn't disrupt the interior of the building with a more traditional platform lift we designed a small hidden scissor step lift. 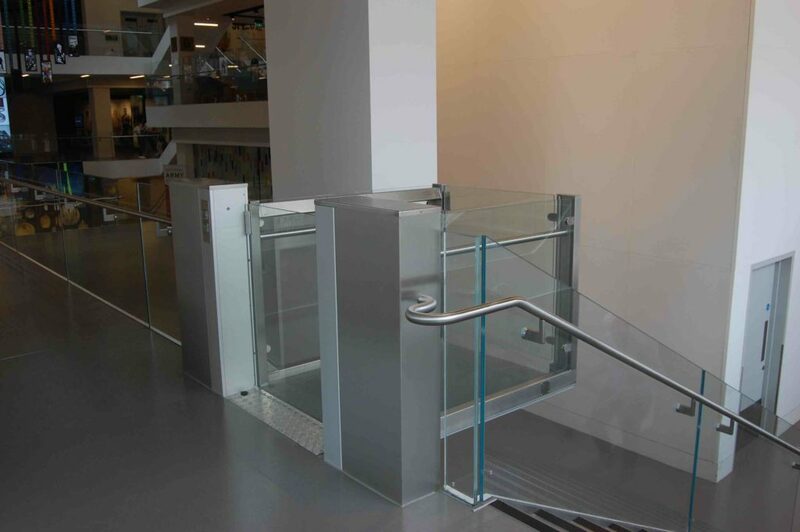 The step lift would firstly rise above the height of the 3 steps between the galleries then travel across to the upper floor level and then lower slightly to meet the floor level. The total travel for the lift was 560mm up followed by 700mm across, we used the LP50H which has a maximum load of 450kg so can easily take a wheelchair or mobility scooter. 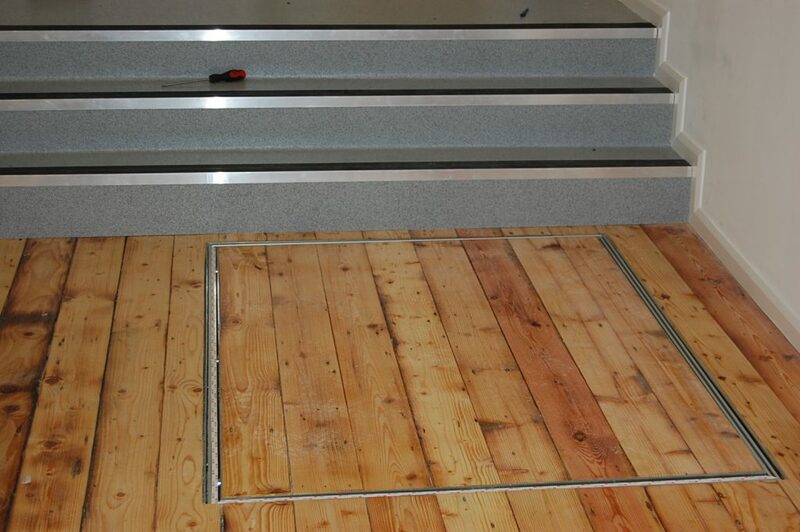 The lift was finished with the same hardwood flooring as the gallery and so disappears into the floor when not in use. The lift was installed in a day and was ready to use by mid afternoon the same day. 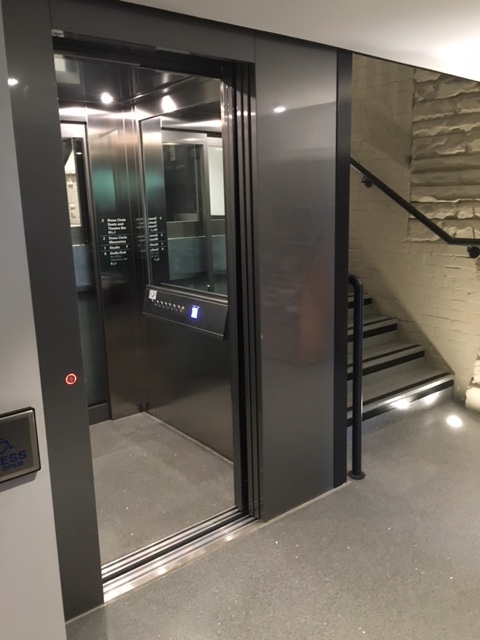 To see more of our platform lifts in historic and commercial buildings have a look at our National Army Museum, Gloriana, York Theatre Royal, Venture House and Chiswell Street projects.